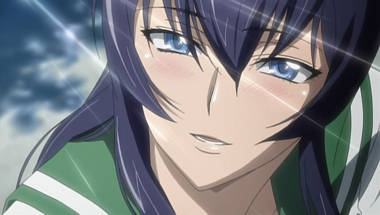 Protagonist Takashi Komuro is your average anime kid. He'd just as soon pine for the girl next door than lead a motley crew of survivors, but c’est la vie. 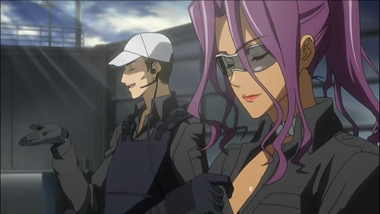 Thrust into a rapidly evolving struggle to survive, Takashi and Co. deal with the living dead, shortage of supplies, and other groups of survivors. Despite its highly intentional details, and love for gritty horror, this work is about as trope laden as possible. 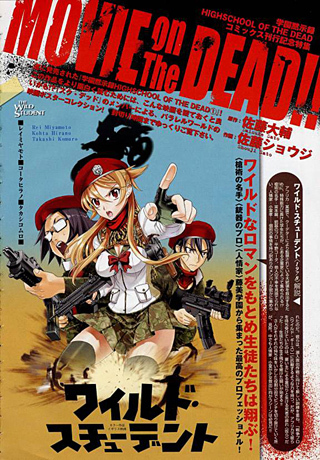 On one hand, they use piles of harem/plot clich&egrave;s, yet all the while trying to satirize a number of other zombie works. Fans of Resident Evil or Shaun of the Dead are sure to recognize the occasional one liner, or familiar store clerk. 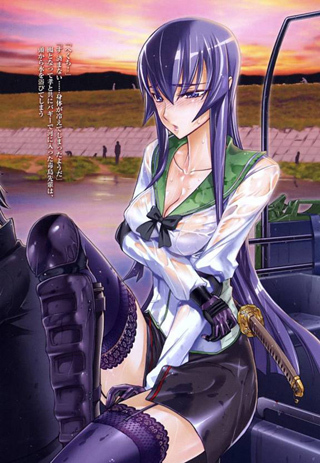 In fact, gun otaku character Kohta Hirano, is a major reference to the mangaka of another hyper violent work, Hellsing. 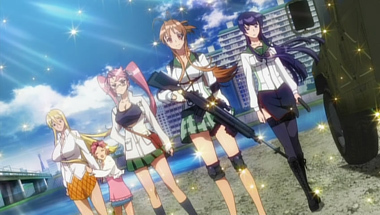 Yet, despite offering me everything I want, and nothing I need, High School of the Dead was a hard sell. "Extreme" would be the word I use. The violence, the sexual objectification, all pushed to a razors edge of being so excessive it loses all value. This is a cautious warning, as this reviewer enjoyed it all, yet probably is more zombie-addled than the average reader. 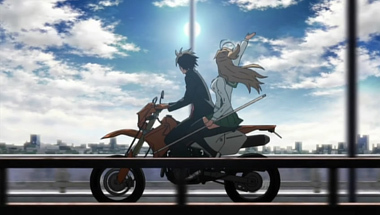 While in no way groundbreaking, there are plenty of interesting and creepy happenings to pique a viewer's interest. 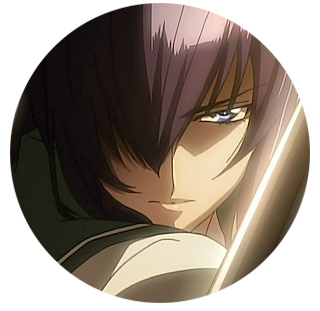 One of the most notable happens to be the decidedly non-nurturing homeroom teacher who leads a parallel group of survivors. 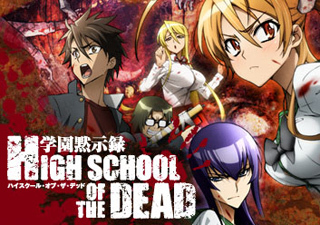 It may lack the charm of a Zombieland, or the comedy of a Planet Terror, High School of the Dead might just scratch an itch. That said, if you think the whole "zombie thing" is overdone, seek other entertainment. 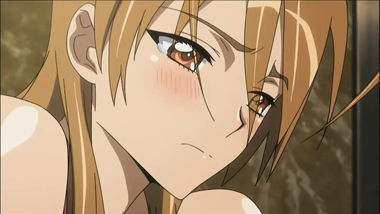 The entire series can be seen on The Anime Network, and at twelve episodes, isn't a time sink with serious commitment. 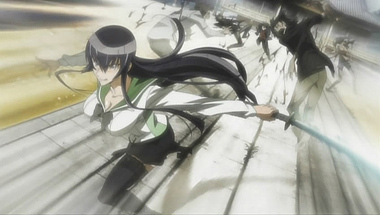 Below: Scenes from High School of the Dead. 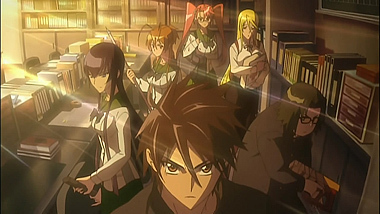 Below: Promotional and poster artwork from High School of the Dead.